There are hundreds of modern, retrocomputing projects out there that put ancient CPUs and chips in a modern context. The Neon816 from [Lenore] is perhaps one of the most impressive projects like this we’ve seen. It’s a classic system in a modern form factor, with modern video output, mashed together into a MiniITX motherboard. The powerhouse of this computer is the Western Design Center W65C816 CPU. This is the second generation of the venerable 6502 CPU, the same chip found in everything from the Commodore 64 to the Apple II to the Nintendo Entertainment System. The 65816 is a 6502 at start-up until you flip a bit in a register, at which time the signalling on the address bus becomes much weirder. 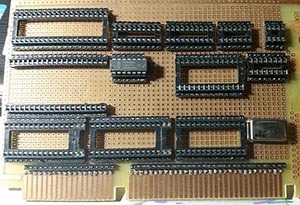 We’ve seen some single board computers based on the 65816 before and The 8-Bit Guy has a few ideas to build a computer around this CPU, but for the foreseeable future work on that will be trapped in development hell. Of note, the Neon816 will feature DVI output (I guess technically you can just run the analog signals through the connector), a PS/2 Joystick input, two Atari / Sega joystick ports, MIDI in and out, a PC-style floppy disc connector, and a Commodore serial bus. It’s a hodge-podge of classic retrotainment, all in a single MiniITX motherboard. The key other feature of the Neon816 is an FPGA, specifically a Lattice XP2 8000 LUT chip that is used for video and audio. This is combined with 1MB of main RAM (looks like a simple SRAM) and 128k of Flash storage for the ROM. There’s also an SD card in there for storage. Right now, [Lenore] is populating the first prototype board, and we can’t wait to see some video generated with this impressive little system. One of the better retro historians out there on YouTube is the 8-Bit Guy, and after years of wanting to do something like this, it’s finally happening. The 8-Bit Guy is building his dream computer, heavily inspired by the Commodore 64. Before we go into what this computer will do and what capabilities it will have, it’s important to note the 8-Bit Guy is actually doing a bit of market and user research before dedicating a year or more to this project. He’s asked other famous retrocomputing YouTubers for their input on what their ‘dream’ retrocomputer should do, and they’ve come up with a basic list of requirements. The Dream Computer will be like working on a 1957 Chevy, in that all the registers are immediately available for peeking and poking. The computer will be completely comprehensible, in so far that one person can completely understand everything, from the individual logic gates inside the CPU to the architecture of the kernel. It’ll run BASIC. In the age of the Raspberry Pi, one might ask, ‘why not go with a Raspberry Pi?’. To the 8-Bit Guy, the Pi is just a Linux computer. Other retrocomputing projects of a similar scope to this dream computer also fail: The Mega65, a project to resurrect the Commodore 65, will be too expensive. The BASIC Engine fails because it only does composite out, and it runs on an ESP anyway, so you’re shielded from the real hardware. The same problem exists with the Maximite in that the hardware is one layer of abstraction away from the interface. The C256 Foenix is probably the closest to meeting the design goals, but it’s far too expensive, and even without the MIDI ports, SID chips, and other interesting hardware, it would still be above the desired price point. The ‘requirement’ for this dream computer is to use only modern parts, have VGA or HDMI video out, a real CPU, preferably a 6502, use no FPGA or microcontrollers, and can run Commodore Basic. Also, this computer would cost about $50, with $100 as the absolute, maximum limit (implying a BOM cost of around $15-$25). This is absolutely, completely, astonishingly impossible. I would be deceiving you if I did not mention the impossibility of this project happening with the stated goals. This project will not meet the goal of selling for less than one hundred dollars. That said, there’s no harm in trying, so The 8-Bit Guy is currently working with a few dev boards, specifically one designed around the 65816 CPU. The 65816 is an interesting chip, in that it is a 6502 until you flip a bit in a register. It has a larger address space than the 6502, and everything from the World of Commodore should be (relatively) easily ported to the 65816. Why was this CPU never used in Commodore hardware? Because a Western Design Center sales guy told a Commodore engineer that Apple was using it in their next computer (the Apple IIgs). The option of Commodore ever using the ‘816 died then and there. If you’d like to help out on this computer, there is a Facebook group for organizing the build. This Facebook group is a closed group, meaning you need a Facebook account to login. Unfortunate, but we’re looking forward to a year of updates around this dream computer. Building a computer that meets the specs is impossible, but we’re more than eager to see the community try. A few weeks ago, I was browsing Tindie on one of my daily trawls for something interesting to write about. I came across something I hadn’t seen before. 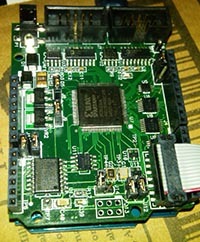 The Mensch Microcomputer is a product from Western Design Center (WDC) that puts a microcontroller based on the 65xx core on a small breakout board. I’ve played around with some of WDC’s tools and toys before, back when the sent me a few dev boards to review. They’re cool, and I have considered building a little breakout board for this weird cross between a microcontroller and a system on a chip. Life gets in the way, and that project sat on the shelf. The Mensch, however, was cheap and well into impulse purchase territory. After buying one, one of the VPs at WDC asked if I’d be interested in doing another review on their latest bit of hardware. Sure. I got this. From time to time, we at Hackaday like to publish a few engineering war stories – the tales of bravery and intrigue in getting a product to market, getting a product cancelled, and why one technology won out over another. Today’s war story is from the most brutal and savage conflicts of our time, the console wars. The thing most people don’t realize about the console wars is that it was never really about the consoles at all. While the war was divided along the Genesis / Mega Drive and the Super Nintendo fronts, the battles were between games. Mortal Kombat was a bloody battle, but in the end, Sega won that one. The 3D graphics campaign was hard, and the Starfox offensive would be compared to the Desert Fox’s success at the Kasserine Pass. In either case, only Sega’s 32X and the British 7th Armoured Division entering Tunis would bring hostilities to an end. In any event, these pitched battles are consigned to be interpreted and reinterpreted by historians evermore. I can only offer my war story of the console wars, and that means a deconstruction of the hardware. The 6502 is a classic piece of computing history. Versions of this CPU were found in everything from the Apple ][, to the Nintendo Entertainment System, and the Commodore 64. The history of the 6502 doesn’t end with video games; for the last forty years, this CPU has found its way into industrial equipment, medical devices, and everything else that doesn’t need to be redesigned every two years. Combine the longevity of the 6502 with the fact an entire generation of developers first cut their teeth on 6502 assembly, and you have the makings of a classic microprocessor that will, I’m sure, still be relevant in another forty years. The cathedral of The 6502 is Western Design Center. For more than 35 years, WDC has been the home of 6502-related designs. Recently, WDC has been interested in the educational aspects of the 6502, with one of the VPs, [David Cramer], lending his time to an after-school club teaching opcodes. The folks at WDC recently contacted me to see if I would give their hardware a close look, and after providing a few boards, this hardware proved to be both excellent. They’re great for educators adventurous enough to deviate from the Arduino, Processing, and Fritzing zeitgeist, and for anyone who wants to dip their toes into the world of 65xx development. The 6502 CPU is probably the most famous of all the 8-bit processors out there, whether in the form of bare chips for homebrew computers, or as slightly modified derivative chips found in everything from the C64, the NES, and the BBC Micro. For this edition of the Hacklet, we’re taking a look at all the 6502-based builds on hackaday.io. There aren’t many transistors on a 6502, making it perfect for implementing on an FPGA. [Michael A. Morris] has an Arduino FPGA shield, and his soft-6502 project is called Cameleon. There’s a bunch of SPI Flash and FRAM on board, and the 128kB of (parallel) SRAM on the board is more than enough to handle any computational task you can throw at it. Since the Cameleon is built on programmable logic, [Michael] thought it would be a good idea to put some of those unused opcodes to use. There are instructions for coprocessor support, and a bunch of instructions specifically designed to make the Forth implementation easier. Maybe programmable logic isn’t your thing, and you’d just like a simple computer like the Ohio Scientific or the Apple I. The L-Star is for you. That’s [Jac Goudsmit]’s build featuring a 6502, a Parallax Propeller, and little else. The Parallax Propeller is a powerful (multi-core!) chip that’s easily capable of handling video out, keyboard in, and serving up the ROM and RAM of a computer. [Jac]’s build does it all beautifully, and if you’re looking for the easiest way to run code on a 6502, this is how you do it. 6502s were found in just about everything, and while poking around at the local e-waste recycler, he stumbled upon something rather interesting. The case badges screamed, “BS medical device”, but after poking around a bit, he figured out this was an MTU-130 system, a machine that was apparently the top of the line in its day. There’s some weird stuff going on in this machine – 18-bit addressing and 80kB of RAM. So far [Eric] has managed to dump the ROM, and he’s taking a look at the floppy controller board to see if he can figure out how it’s mapped. It’s one thing to figure out what’s broken on an Apple II or C64; those are well documented machines. It’s another thing entirely to figure out a machine very few people have heard of, and we tip our hat to [Eric] and his efforts. [BladeRunner] is designing the SheMachine with 1MB of SRAM – more than enough, really – and is mapping all the memory through a CPLD. That’s how you should do it, anyway. We’ve seen our share of homebrew computers over the years. Usually, these bare-bone systems use a small, early 80s-era microprocessor such as the Z80 or 6502. These little 8-bit machines are awesome, but somewhat limited in their capability. [BigDumbDinosaur] sent in a computer he’s been working on for a few years now featuring the infamous 65816 CPU – the same CPU found in the Apple IIgs, the Super Nintendo, and [Jeri Ellsworth]’s C-ONE computer. 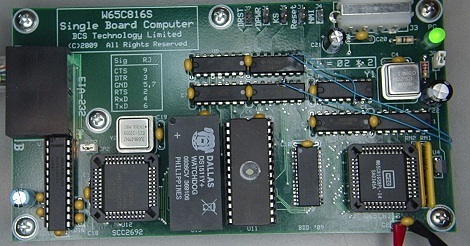 The 65816 is a direct descendant of the venerable 6502 CPU found in the Commodore 64, Apple II, and just about every 80s microcomputer of note. 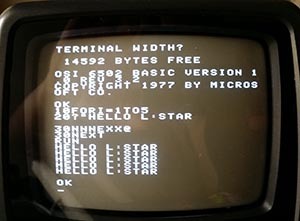 [BigDumbDinosaur] chose the 65816 for its backwards-compatibility with the fun to program 6502 and the ability to use high clock rates and tons of address space for a very cool design. After a ton of careful design and consideration, [BigDumbDinosaur]’s computer included a real-time clock, a watchdog timer, a serial port, 256kB of ROM, and 128kB of RAM. It’s a really wonderful build, but [BigDumbDinosaur] isn’t done with this project yet. He’s working on version 2 of a 65816 computer that will use programmable ‘glue’ logic, a lot more RAM, have a SCSI interface (for a hard drive), and have preemptive multitasking. Jan--Henrik wrote a reply on Soda Bottle Display. Sven Jungclaus liked robot hand || bionic hand prosthesis prototype. Jan--Henrik liked Soda Bottle Display. Predrag Koncar liked Desktop size CNC milling machine from scratch. aquaticedge wrote a comment on Vacuum tube single digit calculator.